Every time we have an Arcati Crisis show I want to make it special. I can’t help myself. When you play in the same city to largely the same crowd over and over again you have to keep it interesting. Spice things up a little. Well, tomorrow night at the Tin Angel (7:30p, $10, you should come) is going to be spicy enough – it’s our first show with both Zina on drums and Jake on bass. It’s also my birthday show. It’s also our nearly annual Fall Extravaganza. 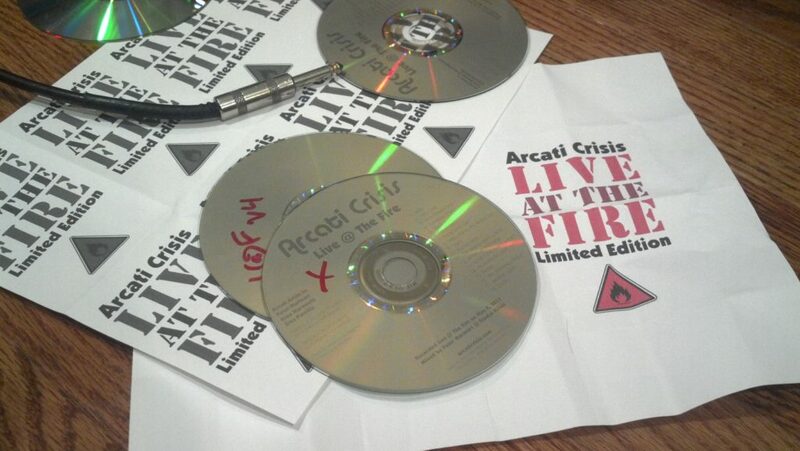 Thanks to brand new mixing software and a few quick car trips and a week off from work, Arcati Crisis is ready to release our fifth totally DIY album at tomorrow night’s show – and it sounds really, really, really good. I’m in a bit of disbelief that we played it or that I mixed it. It’s a 10-song, 18-track LP of one of our first shows with Zina on drums at Philly venue The Fire, and it’s only available as a fan appreciation reward from the band. What that means exactly I’m not sure. I’m going to figure it out while I’m asleep. Of course, even with a week off I’m going to be up until the wee hours of the morning before a show burning these suckers, but that’s the price I pay for instant gratification.